Tsum Valley Trek offers you trekking to one of the remotest Himalayan Valleys which was a restricted region until recently. It is located in the east of Manaslu, the border to Tibet. Tsum valley is the home of the descendants of Tibetan people known as Tsumbas. The route was open for trekkers only in 2008 so it still remains uninfluenced by modernization and the outside world. Because it awaits to be explored, you will have a great time looking around. A lot of ancient villages and monasteries are there to get explored and identified. Mu Gompa, the largest monasteries in the valley at 4,000 meters is one of the highest trek points here and also an important landmark. This is also the highlight of this trek. The Tsum Valley Trek gives you an opportunity to experience the majestic mountains such as the Ganesh Himal, Shringi Himal, and Boudha Himal ranges. 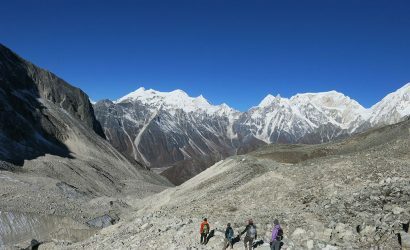 The trail also leads to the various sacred pilgrimage site of Tsum Valley that heads towards upper Budi Gandaki River Valley through unexplored countryside which is populated with a lot Tibetan communities. 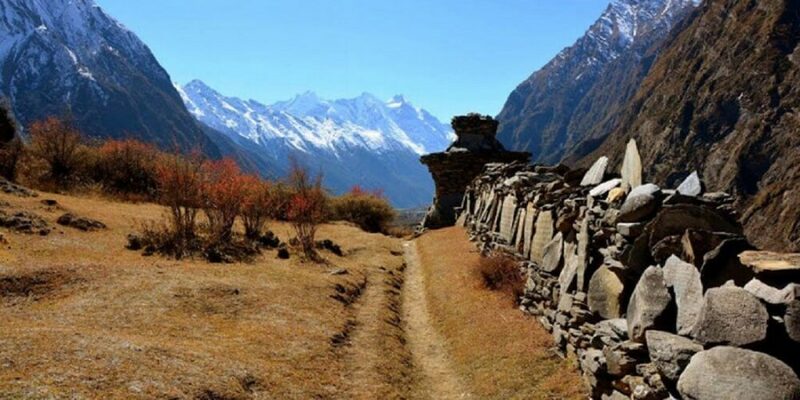 The trail further passes through Tsum village such as Chhokangparo, the hidden land that still lives under the influence of the historic culture and tradition of Tsumba. The beautiful mountain peak views of Ganesh Himal Range, Shringi Himal, Bauddha Himal and Himalchuli is jaw-dropping. The socio-cultural aspect of the place is extremely enticing. Filled with Buddhist monasteries, nunneries, chortens, prayer walls, religious monuments, the longest mani walls at Dzong and Phurpe and a lot more. You will be accommodated in warm traditional tea houses that offer you local food Dal, Bhat, Vegetables, Noodles soup, and rotis or phaley. The Tsumbas have a unique culture. They practice polyandry, where all the brothers of a family are married to a single girl which is a common practice amongst the people there. The Tsum Valley Trek requires a special permit. 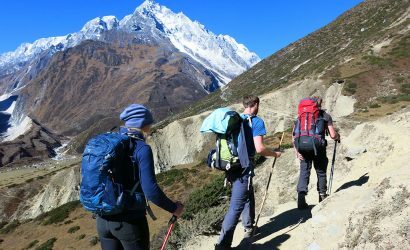 The trek can be combined with Manaslu trekking as both of the routes lies in the same area. You can check back or contact us to book the program. Before 2008, you could only trek around Manaslu trekking route. The trek starts after a long scenic drive from Kathmandu to Soti Khola. The trail passes through lush forests, terraced fields, and hill villages. When you leave the Manaslu Circuit trail for Tsum valley, you will encounter an amazing view of the hidden valley. You will then pass through the alpine forests, glacial rivers, and a village of the Tibetans who will welcome you with their warm hospitality. Enjoy the landscape, the hospitality and the chilling experience of the mountain ranges. Spectacular and magnificent view of Ganesh Himal range, Bauddha Himal, Himachuli and Sringi Himal. The first day of your trekking begins with your arrival at the international airport in Kathmandu. Here one of our representatives will receive you. You will then be transferred to your hotel where you can rest for the rest of the day. You will be briefed about your trekking and will also be given some more information so it will be easier to get your mindset ready. This is your second day where you will get your permits for the trekking. There will also be a pre-trip discussion and plenty of time to meet your trek leader, guides and, other team members. You will rest and be prepared for the trekking days ahead. In the afternoon, you can explore the historic places and visit UNESCO World Heritage Sites. We can arrange for your tour guide to visit these historic places around Kathmandu. Some of the places to visit are the historic Durbar Square of Kathmandu, the sacred Hindu temple of Pashupatinath, Buddhist Stupas Swayambhu, Boudha and other famous places inside the valley. You will then spend your quality time and rest overnight in Kathmandu. Your trekking starts today. Rest and enjoy the view during your 7-8 hours drive from Kathmandu into the western part of Nepal, Soti Khola from Dhading Besi through Arughat. The dirt road from Dhading Besi till you reach Soti Khola is a bit bumpy. Another option is to hike from Arughat to Soti Khola but we strongly recommend taking a transportation. Get a good rest for the night and at Soti Khola and be prepared to trek the next day. After early breakfast, you will begin your trekking today. You will have to cross the bridge over Budhi Gandaki River and then pass through beautiful Sal forests (Shorea robusta tree). The trekking route is a combination of ups and downs, tropical waterfalls, rocky steep pathways and cliff ridges surrounded by a tranquil forest. You will then through pass rice terraces and then to a Gurung village of Labubesi. After climbing over a side ridge, you will begin to descend towards a river and then cross another bridge before you reach Machha Khola village. You will rest here overnight on this day. From Machha Khola your next trekking day starts with a narrow route. Today's trekking is all about up and down over the hills. After some hours of trekking, you will then come across Tharo Khola and eventually reach Khorla Besi. After this stop, you will reach Tatopani, a small trailside hot spring. This is a natural spring and is a popular tourist destination for a lot of local tourists. You will then have to ascend over a ridge and cross the Budhi Gandaki. You will then cross a suspension bridge and reach Dobhan Khola and then to Duman. After crossing another suspension bridge over the Yaru Khola, you will have to gear up for an ascend on the store stairs to Tharo Bharyang. Finally after crossing the bank of the Budhi Gandaki you will hike to Jagat. Here you will rest for the night. After your breakfast and checking permits at Jagat, you will be climbing over a rocky ridge to Salleri and descend to Sirdibas today. You will be able to see the valley and the trail will continue to Ghatte Khola. You will then hike up to a large Gurung village, Phillim valley which is famous for schools and police station made by the Japanese. After passing Philim, you can enjoy the view of the forest of the valley that gradually narrows down unless you reach Chisopani. You will then stay overnight at Chisopani. Your journey starts today after breakfast. You will cross a gorge after about half an hour walk. Surrounded by rich nature you will see picturesque waterfall views, blooming forest, and spectacular mountain vistas. Walking with a waterfall on the right side, be sure to get your cameras ready. You will then descend down to the Tsum Valley. Today's trek is all about pine and rhododendron forests. You will view the Himalchuli mountains at 7,893 m and Boudha Himal from Lokpa village. After the village, you will gradually descend towards Lungwa Khola and then again ascend through pines and rhododendron forest to reach Gumlung. After crossing the Siyar Khola you will finally reach today's destination, Chumling. You will also be able to experience the view of the Shringi Himal from here. You will also visit the Chumling Gompa, a monastery at Chumling. You will then rest for the day at Chumling. Today's trekking will give you a great view of the spectacular Ganesh Himal. You will start your trek for the day as usual, after breakfast. After crossing the suspension bridge and walk through Rainjam to Serpu Khola. You will then cross another bridge to Gho Village. After about 2 hours of walking towards Tsum, you will finally reach Chhokangparo. Here you will witness the glory of the magnificent mountains peaks such as Himalchuli at 7,893 m and Ganesh Himal at 7,140m. Then you will relax for the night at Chokhangparo. Now, trekking from here on should be done with a lot of care. After Chokhangparo you will then accelerate to higher altitudes. Because we will gradually start to accelerate you might get altitude sickness if you don't take it slow. If you get any signs or symptoms of altitude sickness, do inform your trekking leader. Always keep yourself hydrated and take it slow. Slow and steady pace will keep you in better condition. You will pass through Lama gaon and after crossing a classic rope suspension bridge you will reach the Rachen Gompa, also called Nunnery Gompa. Then you will cross Shiar Khola and continue walking through Lar (microhydro power), Phurbe and Pangdun villages. You will also notice a Stupa of Buddha on the way crossing the village of Chhule. You will finally have to climb upstream and cross the bridge to reach Nile, your stop for today. You will stay overnight and get ready for tomorrow's journey. Nile is close to the Tibetan border. Today’s trek is short but will take you slightly at a higher altitude. You will walk to the west bank of the valley which goes through the Tibetan landscapes and will climb all the way up to Mu Gompa. Mu Gompa is is your stop for the day. After reaching the Gompa, you can also visit the monasteries there, the Dhephu Doma Gompa. You will stay for a day at Mu Gompa for acclimatization. Acclimatization is very important as you ascend. Your body needs to adjust to the altitude so that you don't get altitude sickness or any altitude related illness. Today we will not be moving any further but will be doing a lot a sightseeing so that you stay active. A day for acclimatization will allow your body to get in pace with the activity that you will be doing the next day, especially reaching to a higher altitude. You will have a lot of activities to do. You will be enjoying sightseeing the Mu Gompa Region. Mu Gompa lies in the highest and remotest part of the entire Tsum Valley trekking trail. It is situated at the altitude of 3,700 m. Mu Gompa is the largest monastery in the Tsum valley region. If you are not tired and want some more adventure, you can go for a hike and try to explore the base of Pika Himal which at the altitude of 4,865 m, which is actually the highest point of the trekking. From the spectacular Mu-Gompa, you are going to trek back through Chhule and Phurbe along the Shiar Khola. After 6 hours of walk, you will finally reach your destination for the day, a small and beautiful village called Burgi Village. After some rest, you can climb up to the Milarepa's Cave (Piren Phu). This is a popular tourist destination for the local as well as international tourists. From there, you can enjoy the magnificent view of Churke Himal, Poshyop Glacier, and Kipu Himal. We will be staying for the night at Burgi Village. Today you will be leaving the Burgi village after breakfast. After a few hours of walk through the forest, you will be descending down to Chhokang Paro. Descending too does need quite a lot of strength and stamina. You will then further descend to Gho and then Sarpu Khola. With the view of the landscape and uniqueness in the culture, believe me, you will have stories to tell when you get back home. You have to start walking down a steep hill to reach Chumling. After continuously descending, you will finally get Chumling where you will be staying overnight. Today too you will be taking a downhill. You will be descending to Philim today. The trekking route continues after breakfast and then you will reach Lokpa. After a while, you will reach a flat trail and then to gorgeous Samba Falls. After about 6 to 7 hours of total trekking time, you will finally reach Philim. There is another trail that passes through the Phillim village which goes up to the Ganesh Himal Base Camp. This trek too is extremely rewarding. But you will be staying for the night at Philim. Today’s trek starts as you descend down to Sirdibas and finally reach to Jagat. You will then descend towards Yaruphant. You will have to continue trekking to Dobhan and then finally reach Tatopani, the hot spring. You are definitely advised to relax and enjoy the natural hot spring. It is a popular destination for a lot of local tourists too. Hot springs are a natural healer, they tend to relax your muscles and rejuvenate you. After some relaxing time, we will then continue to descend from Tatopani towards Khorla Besi where you will stay overnight. Believe me, you will sleep like a baby today. Tatopani is such an awesome hot spring. After your breakfast, you will be crossing the Tharo Khola flowing in a rocky ravine. You will then reach back to your first base, Machha Khola village. Walking back along the Budhi Gandaki River, you will reach the Gurung village of Labubesi. Please take your time to enjoy the culture variation, the landscape, and the scenery. You will then reach Khursane and after the ridge above Budhi Gandaki you will walk through a Sal forest. The vibe there is amazing. You will finally cross the bridge to and reach the final stop for the day at Soti Khola. Overnight at Soti Khola. Today is the last day of your trek, well almost. Starting from Soti Khola, you will be heading up to the ridge of Kyorpani. From Arkhet to Maltar then finally to Sante Bazaar. Well, that will be a long walk but is an easy walk. On the way, you find the hydroelectric plant, where there is a stone paved street that will lead to Arughat Bazar. It will take about 4 hours to reach Auraghat. You will reach there at the mid-day. Finally, this is it. You will then be taking a bus ride back to Kathmandu. It is indeed a 7 hr long drive excluding the traffic. The bus ride along the bank of the Marsyangdi and Trishuli rivers will be just as soothing as you rest and recall your trekking memories on the way back to Kathmandu. Tsum Valley Trek finally will come to an end this day. We will make arrangements for you to be taken to the airport. You will have to reach the airport 2 to 3 hours before your scheduled flight. If you have extra time to tour around the city or other parts of the country, you can tell us and it will be managed accordingly, and if you are looking for something adventurous and have time for another trekking adventure, we can manage that as well. This trip to the forbidden hidden Shangri-La is a lifetime event and we are sure that you had the time of your life on this journey. Do visit us for more adventures in your upcoming vacation or journey.